“Equality, work and land” is the slogan of the new radical political party in South Africa that seeks to revolutionize South African politics and contest elections this coming May. 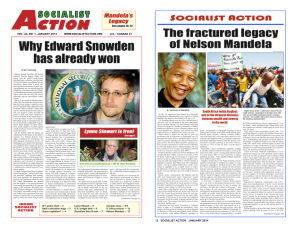 The Socialist Revolutionary Workers Party (SRWP) held its launch congress from April 4-6 in Johannesburg, South Africa with attendance from over a thousand of the party’s militants and cadre from distinct provinces from across the country, as well as international guests from countries such as Zambia, Argentina, Brazil, Sweden, Morocco, and Nepal. The Congress was dedicated to “Fieldmore” Mapeto Baldwin Langa, a member of NUMSA, who passed in August 2018. Fieldmore was a lifelong communist and internationalist, when he was just 17 he joined uMkhonto weSizwe, the armed wing of the African National Congress during the anti-apartheid struggle. Fieldmore was forced into exile and on his return to South Africa in 1994, he became a key activist and intellectual in NUMSA and was central to the union’s political education program. During the three days of work, delegates heard from different members of the Interim Working Committee of the Party such as the convenor of the SRWP, Irvin Jim. In his address, Jim remarked on the path that brought them where they are today and why the creation of this party today in South Africa is so essential. Delegates were reminded that in 2012, the National Union of Metalworkers of South Africa (NUMSA), sparked by the atrocities of the Marikana Massacre, began to chart a new course in South African politics. NUMSA left the African National Congress (ANC)-led Alliance and embarked on a process to form an independent trade union federation as well as a Workers’ Party. In 2017, the South African Federation of Trade Unions (SAFTU) was officially launched with over 700,000 members and in April 2018 they held one of the largest national strikes in South Africa’s recent history demanding just labor laws and an increase to the national minimum wage. In 2018, the goal of creating a workers’ party was also fulfilled. The party was officially registered with the Electoral Commission of South Africa in September and in December 2018, the first national meeting of the newly formed SRWP in Johannesburg South Africa on December 14 and 15. On the second day of work, the delegates split up into different commissions to work on the different issues of the political platform including (education, health, housing, work, etc. ), as well the different founding documents of the party. The SRWP will emerge from this Launch Congress with a political platform, a constitution, a manifesto debated on and defined by its grassroots, as well as elected authorities of the party. They plan to contest the upcoming elections and are certain that the South African working class is ready for a party that promises to upturn the current capitalist system that has made so many South Africans suffer. Right in the worker base! Irvin Jim, general secretary of South Africa’s largest trade union – the 370 000-member strong National Union of Metalworkers of South Africa (Numsa) – is the new chairperson of the Socialist Revolutionary Workers Party (SRWP). Jim accepted the nomination for the position over the weekend at the end of the three-day inaugural SRWP congress attended by more than 1,000 delegates. They included representatives from Argentina, Brazil, Morocco, Tunisia, Zambia, Namibia, Sweden, Spain, the US and Nepal. Also serving on the leadership structure’s central committee, tasked with growing membership, refining policies and the new party’s constitution, is Numsa national spokesperson Phakamile Hlubi-Majola. The SRWP, which is expected to dent the ANC’s worker support base, is contesting the May 2019 national polls. The SRWP enjoys the support of Zwelinzima Vavi’s fledgling South African Federation of Trade Unions (Saftu) with 531,000 members. According to Jim, the decision to launch a workers’ party was taken at Numsa’s special congress in 2013 – triggered by unhappiness with the ANC government “not taking up worker issues”. Jim has described Cosatu’s role within the alliance as that of “rubber-stamping ANC right-wing policies”, which he claims will include the sale of state assets amid the unbundling of Eskom. The SRWP has resolved to determine “a living wage” for its MPs, with a percentage of earnings going to party coffers, similar to the levies imposed by the EFF on its representatives. Members serving on its national leadership should not be appointed to parliament or Cabinet. Party membership eligibility should be open from the age of 14, with socialist programmes taking place during school holidays. All the party’s cadres should undergo rigorous political training, sign a code of conduct and go through a 60-day induction programme. Online, community and the mainstream media should be used to reach out to potential members. A single education system for all South Africans should be created, eliminating private schools. Agricultural studies should be taught from primary school right up to the higher levels. The ministry of education should be depoliticised by following a process similar to that of the public protector in appointing the minister. This will ensure “the minister does not carry political party baggage”. The troubled National Student Financial Aid Scheme should be scrapped and be replaced by “free and decolonised education”. Government’s tender system and broad-based black economic empowerment should be abolished. This should be replaced by new legislation to curb fronting. Labour brokers should be done away with. South Africa: What went wrong?